On route N7 between Brignoles and St. Maximin. 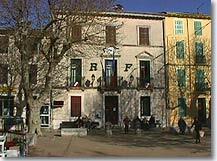 Situated between Brignoles and Saint Maximin, is also at equal distance between Marseille and Aix en Provence. Even in Roman times, Tourves was already a strategic meeting point. Today calm has returned to Tourves thanks to a new road which detours the village. 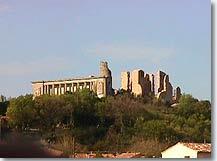 Tourves is dominated by the ruins of a castle from which there is a spectacular view of the valley. From the summit of St. Probace you will also discover the panorama of the chain of Ste. Baume, the Loube, the Carami, and of course the village, itself divided by the river for several kilometers. Let fishermen take note ! Oratories and chapels probably dating to before the 11th c.
Fountains of the Hotel de Ville and the church. Caves and sources La Foux and Baou Mouron. Tennis, Swimming pool. Hiking (Caramy river banks). Rougiers (7 km), La Roquebrussanne (11 km) and Bras (9 km).